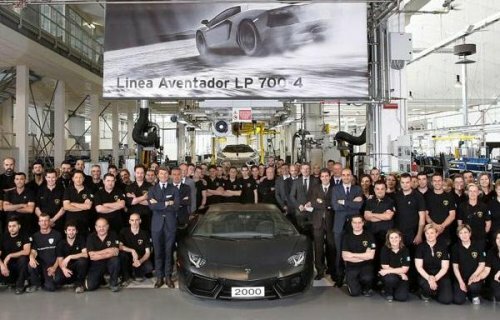 Automobili Lamborghini announced a major milestone for their range topping Aventador LP700-4 today with the 2,000th Aventador rolling off of the assembly line in Sant’Agata Bolognese Italy – a feat which took this modern supercar roughly half the time of the vehicle that it replaced. The Lamborghini Aventador LP700-4 is unquestionably one of the most amazing sports cars ever offered to the road going public and since being introduced, the Aventador has proven to be one of the most popular vehicles ever offered by the Italian supercar builder. Between the stunning jet like exterior design, the gorgeous carbon fiber and leather clad cockpit and the incredible drivetrain, the Aventador stands out in even the most exclusive automotive crowds and it was in vast demand before the first unit ever touched a public road. The result is that in just over two years since being introduced, the Aventador has reached the 2,000 units production mark with every single car being spoken for prior to the start of individual production. The Murciélago (the vehicle that the Aventador effectively replaced) took about four and a half years to see the 2,000 unit mark so not only are there more buyers lining up to acquire an Aventador – the company’s plant is rolling out cars at a much higher rate. The 2,000th Lamborghini Aventador LP700-4 was finished in Nero Nemesis (matte black) and sold to American Thaddeus Arroyo, Chief Intelligence Officer for AT&T. In addition to being a phone company bigwig, Arroyo is also the proud owner of a Lamborghini Gallardo LP550-2 Spyder. After attending an Aventador event in Palm Beach and experiencing the awesome performance of the LP700-4, he knew that he had to put one in his garage and he was the fortunate buyer of a milestone car. Helping Lamborghini continue its impressive sales growth is the new Lamborghini Aventador LP700-4 Roadster which meets the world as one of the fastest and most powerful open top vehicles in the world. Buyers were quick to line up for the Aventador Roadster with pre-orders exceeding what the Italian automaker expected. In fact, the current order banks contain more than a year’s worth of vehicles for both the Aventador Coupe and Roaster which means that if you placed an order for one of these incredible supercars today – you might be lucky to get it by summer of 2014. Even with that in mind, I don’t expect that sales are going to slow as the supercar segment continues to grow with the influx of money from the emerging Chinese market. At the same time, the continued rebound of the American economy (along with success of people like Kanye West and Justin Bieber) will likely keep a steady stream of new Lambos flowing into American exotic car dealerships.